Geekstuff: May 2007 Roundup | Kris Johnson's Blog…sort of. One of these days I’m going to write another real blog entry, but for now a little of the stuff that’s currently flipping my geek switch will have to suffice. 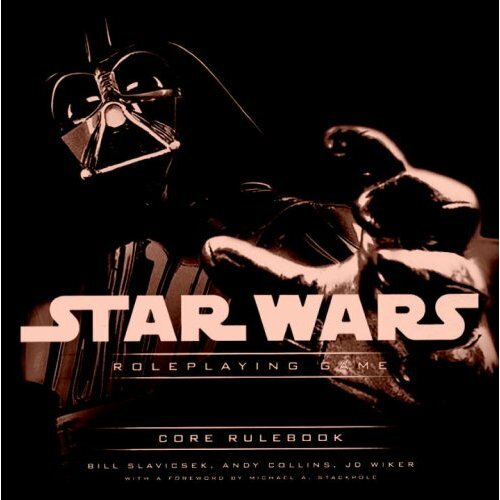 Star Wars Roleplaying Game . My copy of the core rulebook for the new “Saga Edition” has been shipped from Amazon and should arrive in a few days. I’m looking forward to digging into this one, as from most accounts the changes made by Wizards of the Coast make for faster, more cinematic gameplay than was possible using previous editions. Ken Newquist has posted a review on SciFi.com and more thoughts in two separate Nuketown posts. Game Night. On the 29th, Chris Miller, Miscellaneous G™ and I got together intending to play Primetime Adventures, the roleplaying game in which players create a television series then roleplay episodes of the same. We got a little carried away during the creation phase and before we ever got around to deciding who our major protagonists would be we had outlined the major story arc for season one leading up to and including the cliffhanger season finale. I’m not sure whether we’re going to pull it back into Primetime Adventures or take it in another direction, but it was three solid hours of a very interesting creative vibe and we could all see a lot of potential in the end result. Habeas Corpses by Wm. Mark Simmons. I bought this book at the airport in Oklahoma City because I didn’t relish the idea of three hours on two planes with nothing to read. 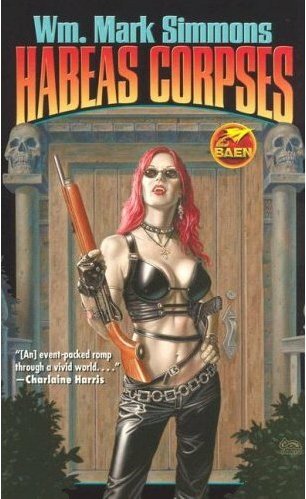 Had I realized that Habeas Corpses is the third book in a series, I definitely would have bought something else. As it was, I was in a bit of a hurry and the cover doesn’t in any way indicate that it’s part of a seriesNot that I saw anything on the cover but cleavage and bare midriff., so I put my money on the counter and rushed to my gate. It’s a decent read that involves, vampires, werewolves, Native American tribal spirits and Nazis. I would give it a wholehearted recommendation except for one thing: the puns. I could understand giving the protagonist a propensity for punnery, but it seems like every one of Simmons’ characters spews puns left and right and after a while it just gets annoying and detracts from the story. Pan’s Labyrinth . This is quite simply the best movie I’ve seen in recent memory. Over the past few evenings, Laura and I have been watching Pan’s Labyrinth with director Guillermo del Toro’s audio commentary. It’s clear that this project was a labor of love for del Toro, and his commentary explores everything from mythical elements in the story to how scenes were lit to how Doug Jones’ faun makeup changes during the course of the film. Unfortunately, del Toro has a voice that puts Laura to sleep after about fifteen minutes, so it’s taking us a bit longer than usual to get through the commentary track.